Hotels that have been modernised so far include Pyramida in Prague, the capital city, Horizont in Šumava forest land, and Voroněž in Brno, the Moravian largest city. Hotel Voroněž currently offers the largest capacity in Moravia, the eastern part of the country. "We continue in an even larger scale. We plan to invest 500 mil. 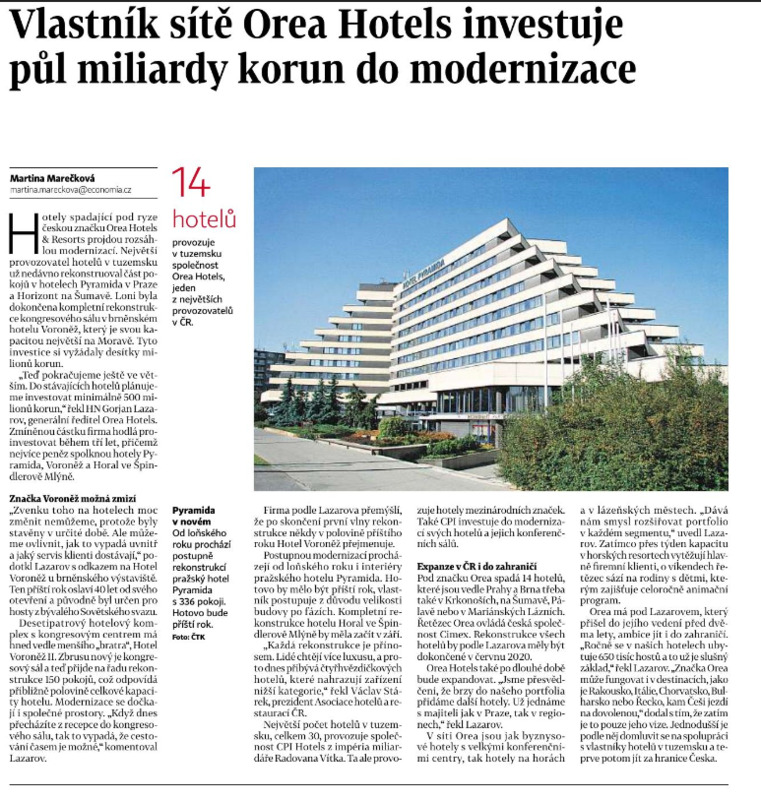 CZK into our current hotel portfolio," says Gorjan Lazarov, General Manager of Orea Hotels. The investment will be poured mainly into hotels Pyramida in Prague, Voroněž in Brno and Horal in Špindlerův Mlýn, and should take place within the next 3 years. "We can't do much about the facade. What we can influence is the interior and the service our clients receive," says G. Lazarov. Hotel Voroněž is celebrating 40 years in the vicinty of Výstaviště Brno fair grounds and has a brand new congress hall. "When you walk from the reception to the congress hall, one can feel that travelling in time is possible." The company has thought about changing the hotel's name next year. Orea Hotels consists of business and leisure hotels, counting together 14 hotels located in Prague, Brno, Krkonoše mountains, Šumava forest land, Pálava wine region and in Mariánske Lázně spa town. The modernisation of all units should be completed by 2020. "It makes sense for us to extend our portfolio in each of the segments," adds G. Lazarov. Václav Stárek, President of the Czech Association of Hotels and Restaurants comments: "Every reconstruction is beneficial. People want more luxury and that is why the number of 4* hotels has been rising and replacing lower category accommodation."